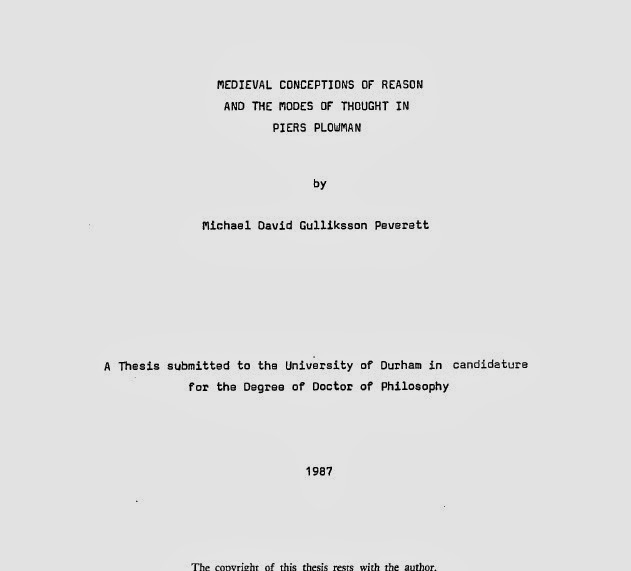 "Medieval Conceptions of Reason and The Modes of Thought in Piers Plowman"
I discovered recently that the University of Durham librarians have been busy scanning Doctoral Theses, including this one. Ah, that clunky electric typewriter! and all that Tippex! 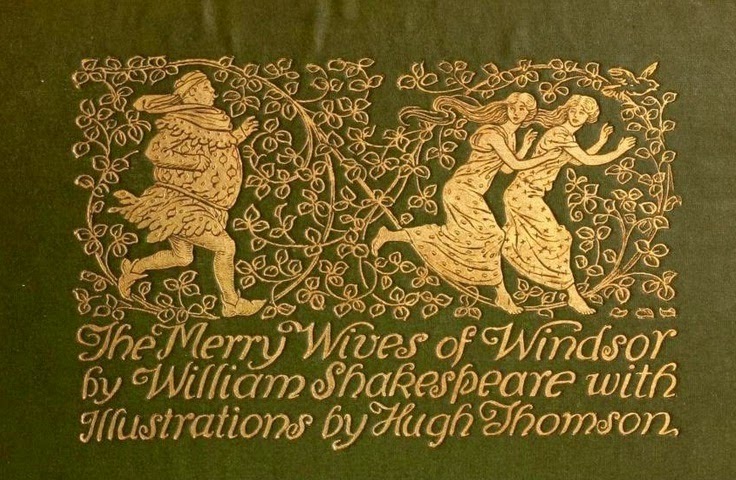 conclusions (for the moment) about The Merry Wives of Windsor. I do not think it was written for, or performed at, the Garter ceremonies in April 1597. There is no evidence that plays ever formed part of Garter ceremonies, nor that plays were commissioned by or for the Monarch. The play does, undeniably, include a few underlined Garter references that seem to pierce the 4th wall, but why (or in reference to what occasion) is unclear. Accordingly, the only firm evidence to date the play is that it can't be later than 1601 (when the bad quarto emerged). Principally this is because of the Falstaff crew. I see Pistol and Shallow being "introduced" in Henry IV Part 2, I see Corporal Nym being "introduced" in Henry V. In my opinion the Merry Wives takes recognition of these characters for granted. It is quite characteristic of the low characters in the Henriad (collective name given by scholars to the two parts of Henry IV plus Henry V) that what later become their defining features are not in full effect from the start. In 1H4 Bardolph's red nose is not mentioned at first, and the language of the "Hostess" isn't immediately full of suggestive pratfalls; in 2H4 Pistol isn't instantly Marlovian; and in H5 Nym takes a few speeches before he actually brings out the word "humour". This may be partly because Shakespeare fleshed out the characters as he wrote, but it's also to build up the audience's acquaintance with a character piece by piece. You need to know, for example, that Nym considers himself a man of few words. He has only a small part here, but such humour as it has (oh God, I swear that was unintentional) depends on the way that Nym and Pistol bounce off each other in their various swaggerings. More to the point, it depends on the audience remembering how they bounce off each other in H5. It is a reprise.